WEST WINDSOR – Mercer County Community College student Dan Asnis will be recognized by the American Heart Association with the “Lifestyle Change Award” during the Greater Mercer County Heart Walk on Sunday, Sept. 8. Asnis, of Kendall Park, said that in April 2011 he decided that his health depended on him making substantial changes. He was 5’ 11” and weighed 306 pounds, and had a history of diabetes in his family. Less than 18 months later, Asnis had lost 120 pounds and his blood sugar – which was in the pre-diabetic range – is now at normal levels. He said he was able to accomplish his goal by joining Weight Watchers, which has enabled him to continue to eat the same foods, but in moderation. 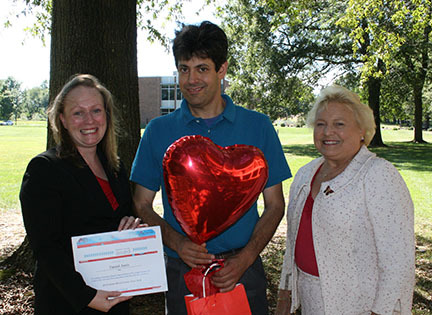 In preparation for the American Heart Association's Greater Mercer County Heart Walk, Mercer County Community College student Dan Asnis (center) was recognized with a "Lifestyle Change Award" from the American Heart Association. Pictured with Asnis is Heart Walk Director Melissa Kidd (left) and MCCC President Patricia C. Donohue. The Heart Walk takes place at Mercer County Park in West Windsor. The event opens at 8:30 a.m. with educational and family activities, with the program beginning at 9:30 a.m. The walk starts at 10 a.m. Participants may choose either a one-mile or three-mile track. For more information visit www.heart.org.